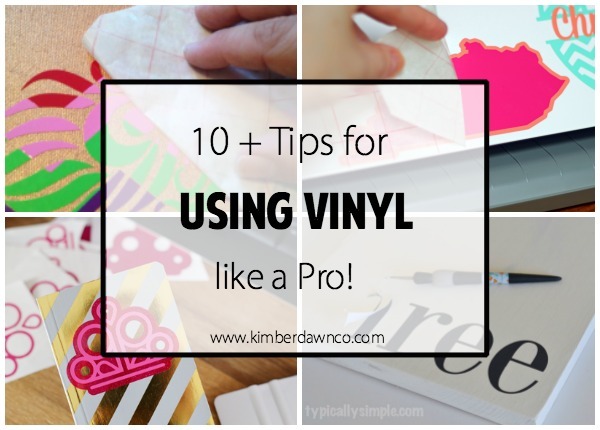 10+ Tutorials on How to Use Vinyl Like a Pro! Vinyl can be so intimidating am I right? If you are just starting out or if you have been using it for a while here are some tutorials on how to use vinyl like a pro! Once you have read through these tutorials you will be a pro yourself and you will be putting vinyl on everything! Click on the title or image to be taken straight to the tutorial. Transfer paper is a genius hack for applying vinyl. Check out this tutorial for great tips and tricks on using it to apply vinyl. If you have always wondered how to add multiple layers of heat transfer vinyl then this tutorial is perfect for you! Plus it is just an adorable bag so you should make one! This is another great tutorial for adding layer upon layer of vinyl. This will walk you through using adhesive vinyl which can also be scary to tackle! This is a nice tutorial for adding multiple colors of vinyl. This tutorial will walk you through making the different layers and then applying them. Plus it is an adorable way to customize your silhouette! Putting vinyl on cups and tumblers can be so intimidating! This is a great tutorial to help you gain some confidence when adding vinyl that will stick and won’t come off easily. I love the clean look that this technique achieves. Here is a great tutorial for the paint, vinyl, paint, peel method! If you were intimidated by this technique before you won’t be once you follow this tutorial. This is a brilliant way to use multiple small scraps of vinyl and the end result is seriously stunning! This is such a great idea that I never would have been able to figure out on my own! I think we have all had the experience where our vinyl looks like the image on the right. These tips are a must read if you do a lot of projects with small font. Putting a decal on a door can seem like a daunting task. This tutorial is perfect for taking away some of the stress of adding a decal to a door. Once you know how to make a decal this is a great tutorial to try out. There are some great tips for adding vinyl to make a sign. This has a great step by step tutorial for adding a vinyl ruler. She walks you through the entire application process which is extremely helpful! If you have a large project that you want to hang on the wall this is a must read. Learn how to hang it evenly and quickly! Silhouette school has a lot of great tutorials and ideas for using vinyl as well as the silhouette! What tip was most beneficial to you? Share your tips with us in the comments below. What should i use on a coffee cup i plan to wash? Are some Vinyl Dishwasher safe? thank you so much in advance for your reply! Hi! You will want to use a permanent vinyl such as Oracal 651. 🙂 Our favorite place to purchase it is Amazon or Expressions Vinyl.